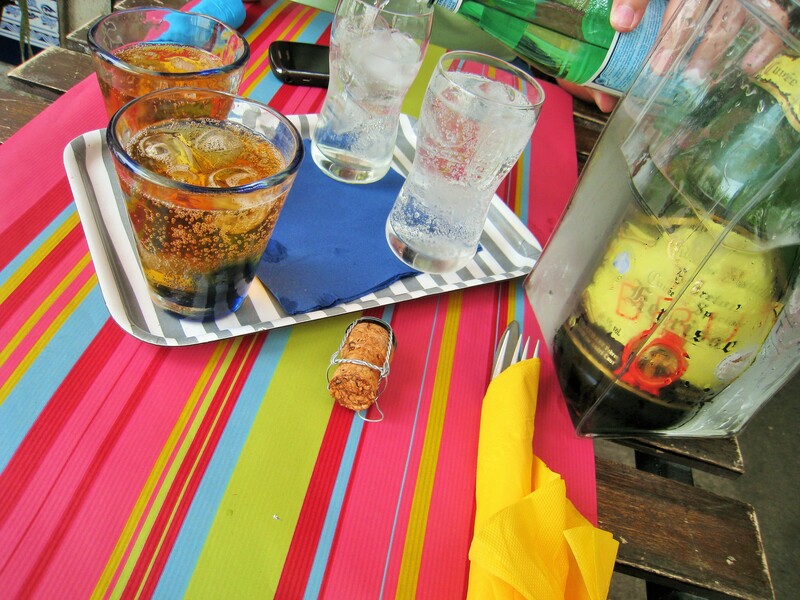 Bars - let's drink chic, Beaches, Best Meals, Brittany, Chefs, Festivals, Fish, food, France, Hotels, Lunch, Restaurants - let's eat chic, Shopaholic abroad, Takeaway, Travel - bon voyage!, Vive la France! This is a post specifically for a couple of wanderlusting pals who are about to set off to France for a deserved break. On their itinerary is Saintes-Maries-de-la-Mer, capital of the marshy region called the Camargue. Driving south on the D570 from Arles, the land is flat and green. 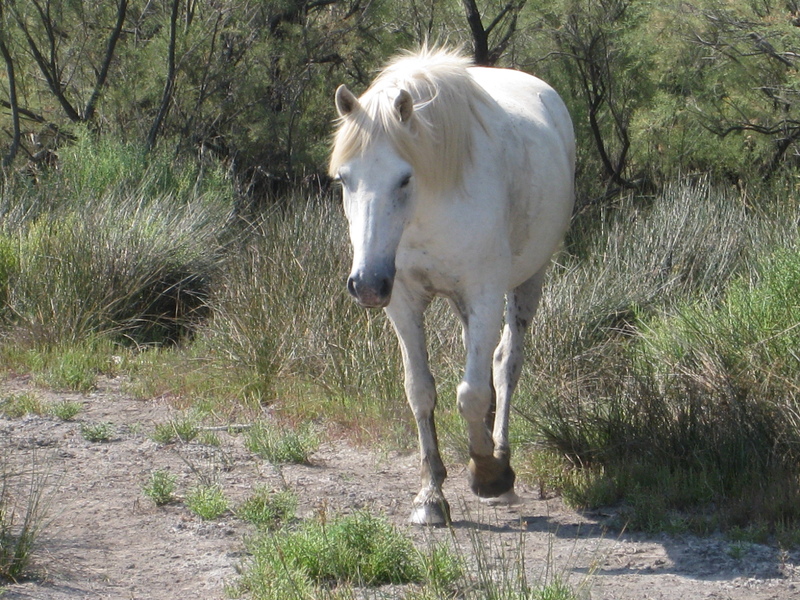 As hotels begin to punctuate the roadside, so do the horses for which this area is known, white or pale grey with wild manes. They’re not necessarily visible in the fields about, but will definitely be there at one of the many riding schools, tethered and saddled and ready to carry the next group of tourists who fancy a spot of equestrianism. We’ve visited the Camargue twice now. On our first visit, the Mas where we stayed was run by a family of Camargue horse breeders, who arranged for us to go on an authentic trek in a properly rural area by the Little Rhône. We had to venture with our guide into some quite desolate marshland, locate and catch our horses and tack them up ourselves. I preferred this by far to the alternative of taking a tired, over-ridden horse from one of the roadside ‘schools’. We fed foals and watched birdlife from our saddles, waved at real cowboys acquainted with our guide and trotted along the river as pleasure boats cruised past at their leisure. I can recommend asking around for one of these treks if horses are your thing. Avoid the tourist trap tours. You’ll be able to spot them a mile off because they’re so obvious and the horses look bored and sleepy. Along this main route into Saintes-Maries are a couple of really good places to eat, in hotels called Mas, after the word for farmhouse or ranch. Some Mas have converted their main house and stables or out-buildings into hotel rooms. The one we stayed in, the Mas de Calabrun, is reached via the D85A, a country road peeling off to the left of the D570, roughly halfway down to Saintes-Maries. It’s quiet, but for the horses braying in a field out the back, and the vege patch is something to be admired. You don’t have to stay here to enjoy their set menu dinners (roughly €30.00 for three courses, excluding drinks), but make sure to book as seating is limited and the food is a subject of local conversation. Using Camarguais ingredients and produce from that vegetable garden I mentioned earlier, their chef de cuisine creates a culinary tribute to the region. Bull meat, or taureau, is a staple around here, so expect to see it on most menus, including at the Mas de Calabrun. However, if you have an overload of bull meat, which is possible in these carnivorous parts, or if you simply don’t like it, ask for an alternative at the time of booking. Most restaurants will arrange this without too much fuss. Another good restaurant set in a hotel on the D570 is the Auberge Cavaliere du Pont des Bannes. Surrounded by ponds, horses and little white cabins, it’s a pretty place to dine, but the prices are pretty steep. If you feel like splurging in style, this is a solid option. You may have to pay for it, but the food is excellent. Wherever you dine, especially if it’s on a terrace or in the proximity of horses, be sure to wear insect repellent and preferably long trousers. Mosquitoes abound in the Camargue. If you’re unlucky and get bitten, remember that toothpaste is an unusual but effective salve; Eight Hour Cream also works well until you can find a pharmacy for bite cream. In Saintes-Maries proper, at first glance it’s a regular, French seaside resort, with the requisite shops flaunting multi-coloured inflatable toys and beach towels. 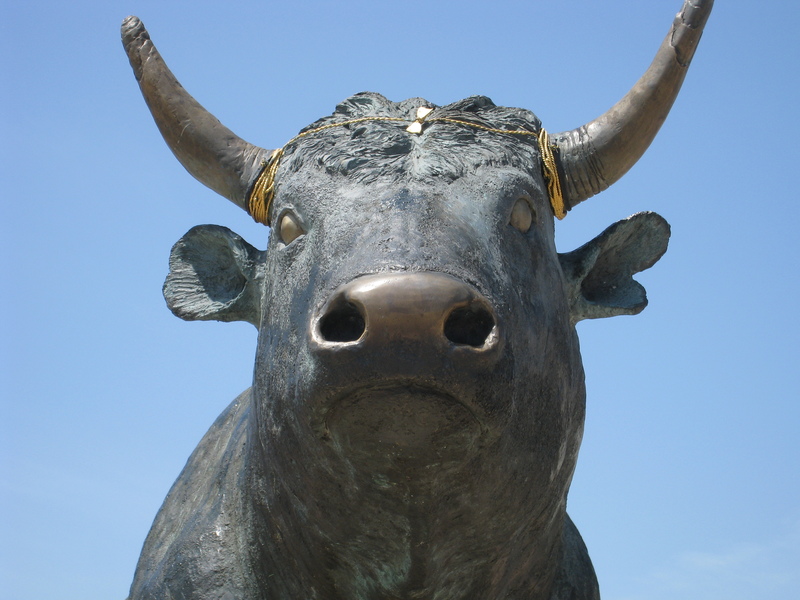 There’s a bull arena for anyone curious about watching bulls run and perform (bull-fighting tends to be non-bloody here, but I’d advise double-checking) and an ample beach for sun-worshippers, of whom there are plenty in holiday season. Do note that if you go to the beach the public loos (on my last visit, at least) are absolutely filthy. Be prepared and take a pack of tissues. You’ll probably want your Euro back (they’re those paid conveniences with the automatic doors). I found it was a better bet to run up to one of the beachfront bars for a quick drink and subsequent relief. At least their facilities showed signs of having been cleaned in recent days. Saintes-Maries-de-la-Mer is named for three saints named Mary (Mary Magdalene, Mary Salome and Mary Jacobe) who, as legend has it, crossed the Med from Alexandria to France following the crucifixion of Christ, landing at this point in the Camargue. Some say that a servant, Sara, accompanied them. A dark-skinned woman, she is the subject of an annual religious festival, to which gypsies or Roma flock in huge numbers. In the centre of town is a large church, the crypt of which contains a statue of Sara. Gypsies are drawn to her and congregate around the church, trying to sell little flowers and the like to tourists. They can be quite persistent. If they annoy you, say nothing and move on, eyes forward. Eventually they’ll give up and move onto softer prey. There’s a main pedestrianised drag , the rue Victor Hugo, running up from the beachfront to the church square. Here you’ll find lots of takeaway food options: baguettes and local fare, lots and lots of ice cream. Apart from the ice cream, which is hard to get wrong, this isn’t the place for inspiring food. Try the little streets to the side, where you’ll find restaurants serving taureau (naturellement!) and planchas, or hot platters of food that’s fun to share. Avoid the paella, go for the fish. It’s always fresh in these parts and tends to be a reliable option. For something a bit different there’s a little Breton crêperie called Chez Fanneù tucked away behind the church. The savoury crêpes are proper buckwheat, or sarrasin galette variety, made hot to order and folded square. You can also get proper Breton cider here: a good, inexpensive option when refuelling is required. Slightly away from town, along the sea front on the corner of rue Léon Gambetta, is the Brûleur de Loups. This is a pleasant restaurant with a slightly retro feel. A long-established eatery in Saintes-Maries, we enjoyed our evening here, with its slightly nineties-style food and old-fashioned service. It gets solid reviews from the French, some of whom liken dining at Le Brûleur to eating in one’s grandmother’s kitchen. It’s better than that, but then French grannies tend to be a touch more Escoffier than ready-meal, so it’s probably a fair assessment. The restaurant serves good seafood and (wait for it) taureau and benefits from lovely sea views. Aigues-Mortes, meaning dead algae, is an interesting walled-town a short drive cross-country from Saintes-Maries-de-la-Mer. Parking outside the medieval walls, with small mountains of blinding-white salt behind, entry to this town is by foot, through one of the ancient gates. It’s pretty, boutique-y and has plenty of interest for French history buffs. The views from the ramparts are worth the climb, but this is not why I mention Aigues-Mortes; I had one of my favourite ever French meals here at a restaurant called Le Minos. Restaurant Le Minos sits on the main square at the centre of Aigues-Mortes, a busy area in summertime, with myriad eateries skirting the perimeter. A lot of these places have large laminated photos of their offerings – a sure sign of tourist magnets. We looked for somewhere more authentic, gravitating towards Le Minos and succumbing to the charms of its white-haired, smiling proprietor. I started this lunch with carpaccio of swordfish – garnished only with a sprinkling of Camarguais salt and a squeeze of lemon juice, this was cool and slippery in the best possible way after a morning spent on horseback under a searing sun. (Yes, I still stank of horse during lunch. Belated apologies to our neighbours.) Then I moved onto the main course: rouille des poulpes. Oh, my sainted pantalon! The white-haired man was right. ‘If you like octopus, you’ll LOVE this,’ he told me with a wink. I do love octopus, and this was some of the most unexpectedly sublime octopus I’ve ever had the fortune to eat. Rouille to me until now had meant the spicy red sauce that’s stirred into soupe de poissons in France. Rouille des poulpes is more of a casserole, comprising chunks of tender octopus and dice of pillow-soft potato in a creamy sauce with just a touch of mustard. Several times a week I think back to this meal, no joke. 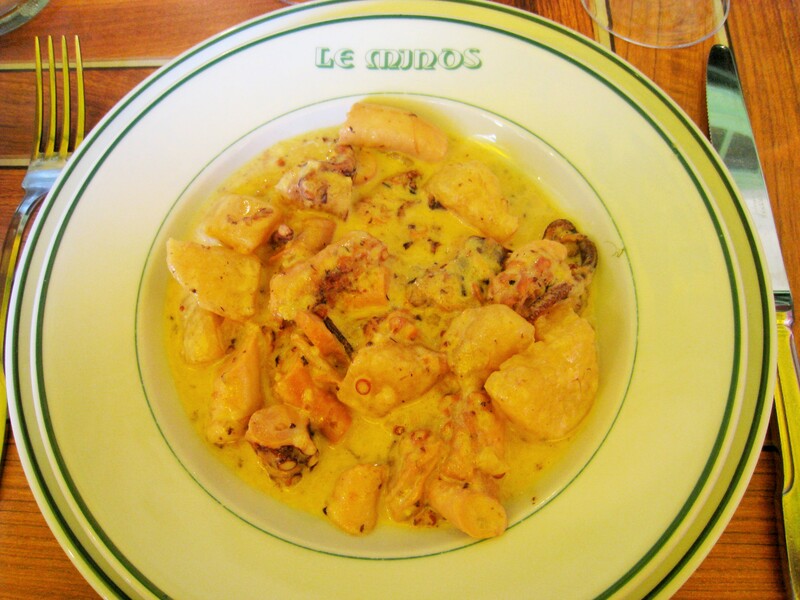 It’s stayed with me and one day I vow to return to Aigues-Mortes just to revisit Le Minos and its marvellous octopus rouille. HIGHLY recommended. Apparently the steack-frites is also good, but hey-ho, it’s not rouille des poulpes. You can get steack-frites almost anywhere. On leaving the Camargue, it’s tempting to do so with a bagful of local products – the salt, the rice, herbs. Maybe a small horse. With the exception of the latter item, most large UK supermarkets stock Camarguais salt and rice, so you needn’t lose baggage space on these items. And if you’re tempted to buy some colourful espadrilles, check them carefully for Made in China stickers. The cheapest ones are no longer French. So, mes amis, I wish you a safe and happy journey. Enjoy the sea air which will make you sleep well, and the local produce which will help you to eat well. Market day in Saintes-Maries-de-la-Mer is Monday, with the addition of Fridays during the summer months. Watch out for cowboys driving bulls from outlying fields to the arena in town. Streets will be closed when this happens. It’s quite a sight – worth asking if this will happen during your visit so you can watch the spectacle.